What Property Types are Eligible for VA Loans? What Property Types are Eligible for Veterans Administration Loans? Veterans of the United States military often wonder what property types are eligible for VA loans and if there are any limitations on the VA Loan Qualified Property Types covered in this mortgage assistance program. The simple answer is that nearly any type of traditional single family residence from modular homes to condos can be considered eligible under the VA loan program. However, ensure your lender is willing to issue a VA home loan before committing yourself to a particular property type. Approved participants in the VA Loan Program can also use these financial benefits to acquire refinancing on their existing homes. Even single family new construction homes can be built using the money provided by this program. 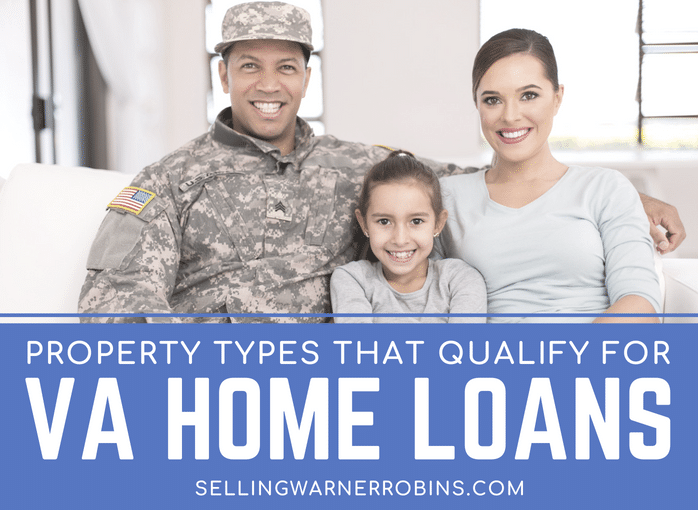 But each type of building has its own set of guidelines for eligibility so check with a VA loan officer to make sure you understand the specific rules and guidelines. Single family homes are the most popular type of property that VA home loans are used to buy. Backed by the U.S. Department of Veterans Affairs, the VA approved nearly 800,000 loans last year and the majority of those were for single family dwellings. It is a benefit you have earned! Using a VA loan is a lifetime benefit our past and present military members enjoy and it does not have to be at the time of your retirement or separation. You can wait until you are ready to purchase a home, regardless how long a period from your actual military service that date is. Unfortunately, co-ops do not fall under the requirements for VA Loan Property Type Eligibility. This type of housing is similar to the purchasing of an apartment in a high-rise condominium complex that you might find in New York City. VA financing ended in 2011 for this property type. Buyers of co-ops are not actually purchasing the land on which this property is located, but instead a share of a nonprofit corporation. By purchasing a share, the owners are allowed to then reside in an individual unit located within the co-op. Co-ops are not one of the VA Loan Qualified Property Types. Condominiums and townhomes are very different from co-ops. In these types of real estate purchases, borrowers are actually purchasing the land on which this dwelling is located. Therefore, condos and townhouses fall under the guidelines for VA Loan Property Type Eligibility in some but not all cases. The drawback is that in order for these types of properties to qualify, the entire condominium or townhome complex must have received approval from the Veterans Administration before an individual unit can be purchased with money provided by the VA loan program. The VA does provide an updated list of approved VA complexes online. If your prospective property is not on the approved list, your lender can request to the VA that it gets added to the approved list. This process can be lengthy and cumbersome so ensure your lender is knowledgeable of the approval process to ensure unforeseen delays are avoided. In some circumstances, modular homes can be considered one of the VA Loan Qualified Property Types. A modular or prefabricated home is one that is actually manufactured and assembled almost entirely in the factory. It is then shipped to the desired location on large trucks where it is pieced together into its final form. As long as the modular home is permanently attached to a foundational structure underneath, has permanent cooking, eating, sanitary, and sleeping options, and has been built according to HUD requirements and guidelines, these properties will usually be considered approved for VA Loan funding. Just a note of precaution…many prefabricated homes depreciate in value which makes them harder to find a lender willing to approve the loan. You may have to check around locally and online to find a lender who is comfortable providing loans on these types of homes. Although it can be much more difficult to acquire government funds for the purchase of new construction homes, it is not altogether impossible for these types of residences to be considered VA Loan Qualified Property Types. The existing guidelines are very similar to those of condominiums and townhomes. In order to use VA funds for the construction of your new home, the building contractor, floor plan and design, and the construction site itself must all be approved in advance by the Veterans Administration. In addition, you will need to have 3 different inspections and the builder will be required to provide at least a 1-year home warranty. However, many veterans skirt this issue by first acquiring a conventional bank loan to build the home, following with the refinancing package from the VA Loan Program. You can also wait until the property is completed then use a VA loan to buy the completed property. Sorry, vacant land by itself does not qualify. Even if you have plans to build a home on the space at some point in the future, the plot of land will have to be purchased outside of the VA loan process. Once the land is bought, you may qualify to use a VA loan to build a new home. See the guidelines for new construction listed above for qualification requirements. In general, you cannot use a VA loan to purchase an investment property. The goal is for you to live in the home, not rent it out to others. However, in some situations, if you have a remaining entitlement balance after using your first VA loan, you may qualify for a second loan using any unused bonus entitlement you have left. As a note, you can only have 1 VA loan per city since they are considered owner occupied properties. However, you can use a VA loan to refinance a rental property that was previously your primary residence. Check with your lender on whether you qualify for a VA Streamline Refinance Loan. If you do qualify, enjoy this extra benefit and build future equity and wealth as a result. Interestingly, you can use a VA home loan to purchase a multi-family unit as long as one of the properties is your primary residence. Also, make sure you check to ensure the units are in a VA approved development or community before you proceed through the loan process. Your lender can help you determine the qualification standards for a multi-family unit in your locale. Often, the standards can be more stringent than buying a single family home. In general, you will be considered for a VA home loan if you are an active duty service member, in the national guard or reserve for 6 years, a surviving spouse, or a veteran. Additionally, you need to have served honorably for at least 90 days during wartime or 181 days during peacetime to qualify. The home you purchase must be in the U.S. or one of its territories and can only be used for a residential property you plan to live in. Once you have firmed up your eligibility, knowing which types of properties you can use your VA loan on will get you pointed in the right direction. Happy house hunting! 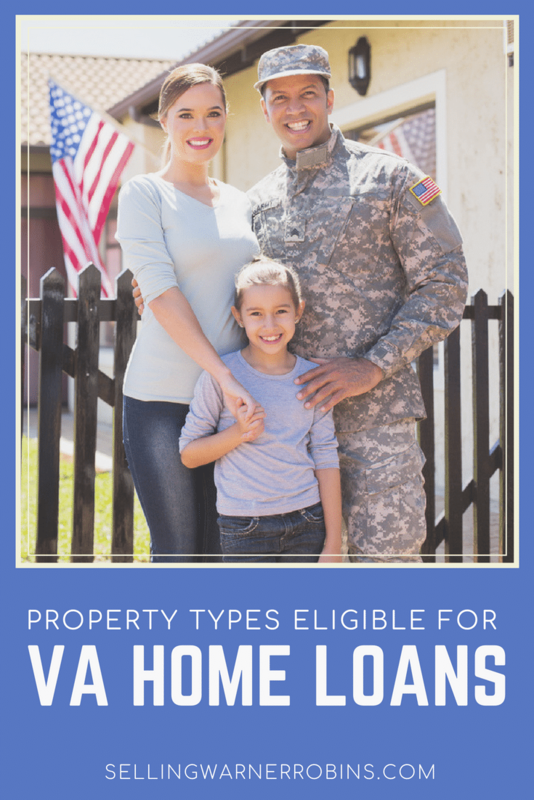 If you found this information on what property types are eligible for VA loans helpful, please consider sharing the information so more VA eligible consumers can find the information. Do You Know What Property Types are Eligible for VA Loans?